Final Fantasy 7 Remake has been a roller coaster of emotions. The gaming community was ecstatic when the game was first announced at E3 2015, only to be slightly dismayed a few months later when it learned Square Enix's plan to make the game episodic rather than one complete title. But today's news, straight from the mouth of the game's producer Yoshinori Kitase, might turn that opinion around. In an interview with Game Informer, Kitase shed some light on the size, scope and content of each individual episode. "It will essentially be a full-scale game for each part of the multi-part series. In XIII, each installment told the story from a different angle," Kitase told Game Informer's Joe Juba. "It was kind of like approaching an unknown territory in a sense." If anyone knows what they're doing, though, it's Kitase, a man well-known for his work as director on Final Fantasy 6, 7, 8, 10 and Chrono Trigger on the SNES. "Whereas with Final Fantasy VII Remake, we already have a preexisting story, so it wouldn't really make sense if that isn't encompassed in a multi-part series ... So, if we're just looking at each of these parts, one part should be on par with the scale of one Final Fantasy XIII game," Kitase said. How Long To Beat, a website that records the time it takes for gamers to get through a game, says that it takes most people around 49 hours and 55 minutes to get through the 13th main installment of the series, and 28 hours to beat its sequel, Final Fantasy XIII-2. You're going to need a lot more Phoenix Downs for this one, kid. When asked about what, exactly, is going to change in the remake, Kitore said that he plans on sticking mostly to the original story ... but isn't afraid to change things up where they're not working. "I, along with [Tetsuya] Nomura-san and [Kazushige] Nojima-san – who are involved with the remake – were also involved with the original Final Fantasy," Kitase said. "We were the people who created it, so in that sense, we don't think anything is untouchable. That isn't to say we're changing everything!" Previous gameplay footage we've seen does seem to corroborate Kitase's remarks about being unafraid to change things up, though, I'm sure not even Kitase himself would dare alter the game's timeless love story and often-spoiled plot twist. 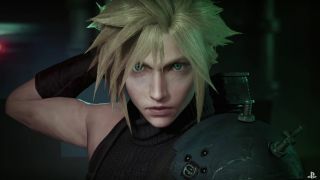 While Final Fantasy 15 recently got a release date, Kitase and his team have been quiet about when to expect the first full Final Fantasy 7 episode. But, with E3 2016 only a few months away, why jump the Gun(blade)?